Thank you for a great February! Thank you to all of our customers who purchased from us in February! It was an exciting month full of Customer Testimonial videos! We hope you enjoyed them just as much as we did. 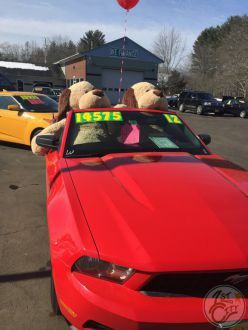 Didn’t purchase from us in February but in the market for a vehicle? Stop by and ask our friendly non-commissioned staff about our exclusive financing options, including first time buyer programs! A dear friend of First City could use a little help! She is a wonderful person who helps her ill sister get to doctor appointments in Boston almost daily. Our friend is retired and we are asking for any amount of money to be donated towards a gas card. All donations will be matched by First City Cars and Trucks. Come to either of our locations to donate. Your gift will be recorded in our “Charity Logbook” and be presented to our friend with the gift card on March 7th. Thank you so much for your support. Chris purchased his 2nd vehicle from First City! Listen to Chris's experience purchasing his 2nd vehicle from First City! Visit our YouTube Channel to watch more of our Customer Testimonials! 7 Reasons to "Like Us" on Facebook. 70% of adults in the United States are on Facebook, that probably includes you! Here are 7 reasons you should "Like US" on Facebook! Thanks to the hundreds of ideas from our customers, we’ve decided on names for our twin pups! Welcome Barb & Paul, otherwise known as “Maw & Paw”! Listen to Tiffany & Tony's experience at First City! Tiffany and Tony just drove away in their 2011 Chevrolet Equinox! Listen to their experience.